COMPANIES with a social mission can now get free banking services and loans at a minimal interest rate at DBS Bank. Under the enhanced Social Enterprise Banking Package, companies that are founded on and run with a social purpose can open a corporate current account with DBS that has no minimum deposit or minimum balance requirement. Previously, they had to maintain a minimum balance of $5,000 in their accounts under this package, but DBS received feedback that even this was too onerous. In contrast, other small and medium-sized enterprises (SMEs) have to maintain a minimum of $10,000 in their DBS accounts. Social enterprises, which include companies that provide employment to former convicts or the disabled, can also get business loans from the bank with an interest rate of 5 per cent a year - less than half the 12.8 per cent annually that is typically charged to the smallest of SMEs. Among other perks, they can issue 30 cheques and take in 20 Giro payments each month for free. DBS' head of enterprise banking Lim Chu Chong said this move was not about making money. 'This move has surprised certain people, who wonder why a bank would bother with this, but... it demonstrates that the bank has a bit of heart and it's not all about making money,' he said. Nonetheless, he added that DBS could reap profit in future if it can successfully help its social enterprise clients grow. About 80 per cent of the 100 or so social enterprises in Singapore already bank with DBS, Mr Lim said. They include Aii, a company that employs the hearing-impaired to make confectionery for corporate events and functions, and Adrenalin Events and Education, which hires at-risk youth to organise corporate events. 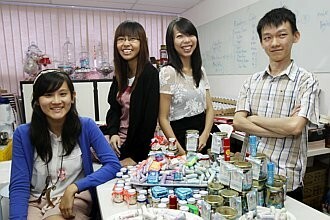 DBS first began reaching out to such social enterprises about five years ago. It rolled out the Social Enterprise Banking Package in 2008, and has enhanced it over the years. The bank plans to champion the cause more actively, and will roll out more initiatives over the next six months to help these companies.